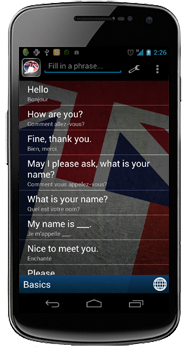 Talk French – Phrasebook for English is our latest release for the Android platform. French is arguably one of the most beautiful languages in the world and is spoken in 29 countries. Now, you will be able to turn your Android device into a French Phrasebook. Over 290 phrases in 14 different categories will help you to be heard in French! The app is very easy to use and features a search function which let’s you find a specific phrase in a heartbeat. This app is perfect for travelers, students, or whoever is interested in the French language. Get Talk French Phrasebook for only $1.99 on Google Play. This application is compatible with all Mobile Devices running Android 1.6 and up.